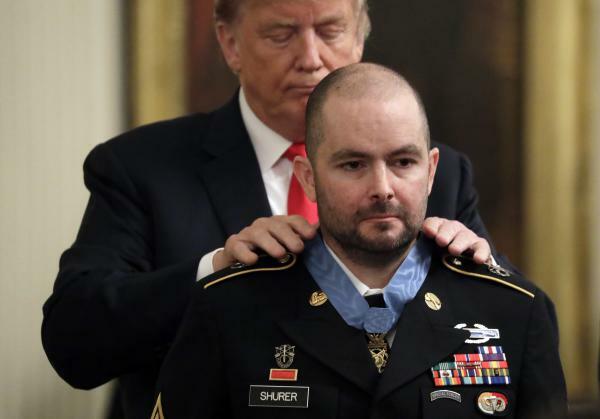 President Trump awards the Medal of Honor on Monday to former Army Staff Sgt. Ronald Shurer for helping save several comrades during an intense firefight in Afghanistan in 2008. Shurer, now a Secret Service agent in Washington, is suffering from lung cancer. Shurer, the only medic in the unit, said he could "feel the dirt kicking up" from the incoming fire all around him. He treated the wounded, but his team remained pinned down on the mountainside. He then took nylon webbing to fashion a makeshift sling, which he used to lower the injured down the mountain. He then helped them evacuate by helicopter. But Shurer wasn't finished. He made his way back up the mountain to take part in the battle in the Shok Valley. At one point, he was hit in the helmet by a bullet and shaken up, but not wounded. The fighting lasted more than five hours, according to the military. "Not a single American died in that brutal battle, thanks in great measure to Ron's heroic actions," President Trump said at the White House in a ceremony on Monday where he awarded Shurer the Medal of Honor. Several Americans were wounded, and one Afghan serving as an interpreter for the U.S. military was killed. Trump told Shurer's story: the son of two Air Force members, he grew up on military bases and wanted to join the armed forces. After graduating from Washington State University, he tried to enlist, but was turned away on medical grounds. "I can't believe they rejected you," Trump said. "Boy, that was a bad mistake." But after the al-Qaida attacks in 2001, Shurer, tried to sign up for the military again, and was accepted this time by the Army. He later qualified for the Green Berets. His heroics in Afghanistan took place when he had just a month left on that deployment, his second to the country. Shurer left the military in 2010, and has since become a Secret Service agent in Washington. But he's now facing a new life-threatening battle — last year he was diagnosed with stage 4 lung cancer. "He's done everything he can. He's been fighting it every single day with courage and with strength," Trump said. "He's a warrior." Shurer, 39, received a standing ovation from those attending the ceremony, including 11 men who fought with him. Also present were Shurer's parents, his wife Miranda, and their sons, ages 10 and 7. Shurer did not speak Monday. But when interviewed previously about the battle on April 6, 2008, he said: "I'm not a hero I just happened to be the medic there that day. The guys trusted me to help them, and I was going to do everything I could not to let them down."